There are many causes of heel pain. Heel pain can be plantar fasciitis but can also be caused by something not related to the musculoskeletal system. Heel pain may be caused by nerve irritation. One of the nerves that comes to mind is the calcaneal branch of the tibial nerve. This, however is not the only nerve that can cause pain the arch and heel. Pain that originates from saphenous nerve irritation can also cause arch and heel pain. This nerve may become irritated from issues with muscle imbalances with normal walking or can be related to overuse type conditions as well. 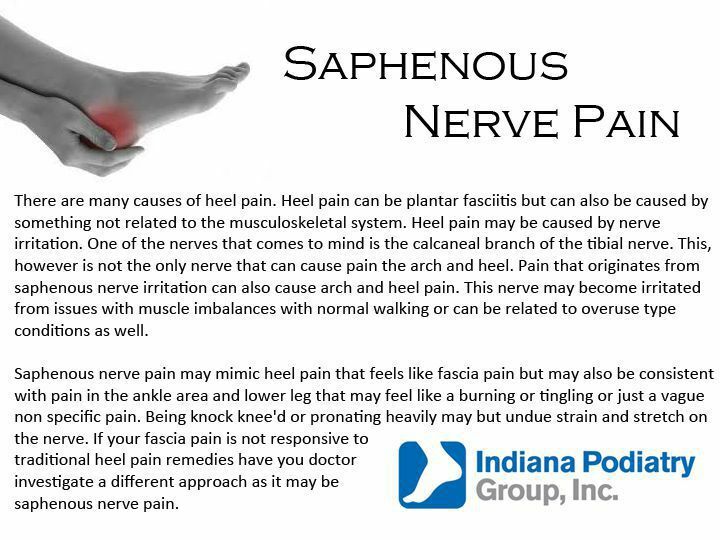 Saphenous nerve pain may mimic heel pain that feels like fascia pain but may also be consistent with pain in the ankle area and lower leg that may feel like a burning or tingling or just a vague nonspecific pain. Being knock knee'd or pronating heavily may but undue strain and stretch on the nerve. If your fascia pain is not responsive to traditional heel pain remedies have you doctor investigate a different approach as it may be saphenous nerve pain. There is no doubt about it that. Thank you!